Whilst the Shows Team was at Triples supporting the DBA Northern Cup we were able to present 2011 UK DBA League winner Colin O'Shea with his trophy. Colin was overseas at the end of the season, but his lead proved just sufficient to withstand the last event, the English Open, at Portsmouth, where the other awards were made. The Junior category was won by Patrick Myers. 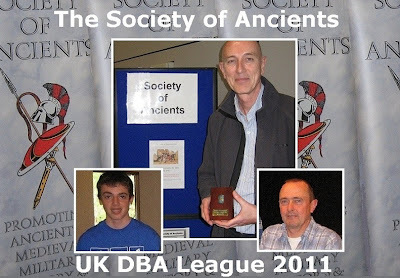 In addition to the awards made at the individual rounds, the top players recieved trophies featuring a hand-made Legionary shield, Colin had a pick of wargaming titles sponsored by Monarch Military Books, and Patrick a Xyston DBA boxed army sponsored by the Society of Ancients. The 2010/11 Season (which ran through to a final round at the English Open) comprised 11 tournaments (4, including the Open counting as Premier events). 1st Colin O’Shea - 85 points; 2nd Martin smith – 81 points; 3rd Richard Pulley – 79 points; Scott Russell – 75 points; Robert Dowling – 72 points; John Drury - 58 points; William MacGillivray; Arnaud Marmier; Mark Skelton; Martin Myers. In all 64 players participated in the event. The Society of Ancients would like to thank everyone involved in the inaugural season, especially the organising team at Portsmouth, Monarch Military Books for joining us in sponsoring the League and all the players who supported our idea.